So, the other day I’m on going downtown, and I’m like – why is the train so busy? I need some headphones. You know, another cheap set of earbuds cuz, eventually the whole yarn-ball of earbuds in the drawer is composed of ones that flicker on-off at high speed and you’re down to using the plain white one that came with your phone – the ones that feel like they’re going to fall out any second. So I go into the Best Buy and don’t even get one step in the door. It’s a wall of people with four registers lined up back to the escalators. I’m like – what is going on? Then I remember oooooh, it’s Black Friday…riiiiiiight. It’s Christmas soon. Right. 180 degrees – about face – head directly out of the door – take a few steps up the block and settle in to do a sketch while ignoring three different groups of dudes trying to get TVs the size of billboards into their uncle’s double-parked SUV. Loved your post – it made me chuckle. Love your sketch too! Beats standing in line at Best Buy for sure! LOVE your sketch, Marc, AND your post! Yeah, I can just picture the whole thing, from the wad of wires in the drawer to the dudes with the giant TVs. And oh, by the way, did I mention I LOVE your sketch?! I would rather pull my nails out with burning tweezers then hit a store on BF! About face was your best defense. In any case you got a nice sketch as a result of the insanity. Would you share your amazing blue sky color pleaseeeee? Gorgeous sketches! This is the Best Buy of the day. Wonderful washes. 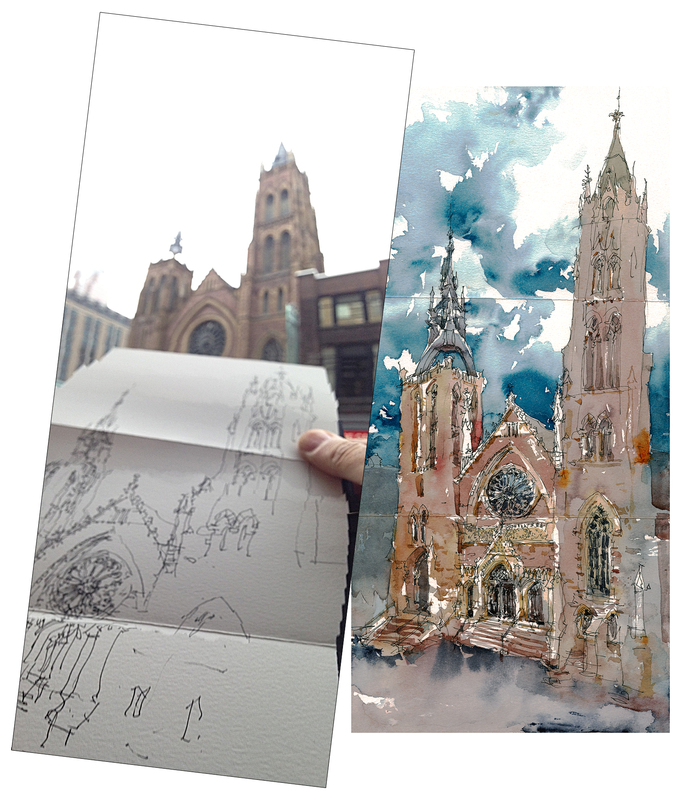 Fun post, Marc–Sketching is great way to stay sane! 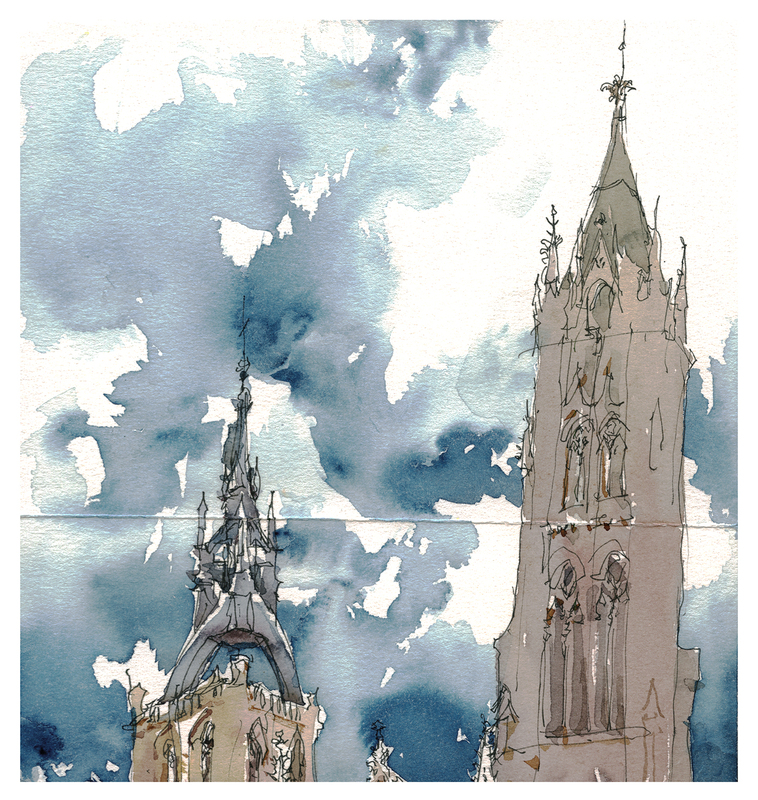 Very evocative watercolor painting! I, too, have those original earbuds and they have yet to fail me. Love this! …both your commentary AND your sketch!!! As one who has worked from home since 1991 — and one who abhors the mercenary buy-buy-buy culture of this season, especially Black Friday/Cyber Monday/Cyber Week etc. etc. — I SO identify with you! Oh Marc, I did have a massive chuckle at your Black Friday observations and antics. Great decision to do a sketch instead. And what a sketch!! Absolutely gorgeous. Thanks for sharing. I did the same thing, went into Michaels to buy a tube of paint and thought “what is with this line up of people half way through the store waiting to check out?” and realized it was BF, I turned and walked out. Your painting is beautiful. I much prefer your Black Friday activity to the shopping option. We spent Black Friday exploring the Delaware Coast trying to get as far away from people and crowds and consumerism as possible. Marc, loved the painting, especially the blues. Do your part for the ‘season’. Empty and toss the contents of your snarled up drawer and order a replacement online. There! You will have accomplished two major things: cleared out some clutter and treated yourself to a trouble free shopping experience. Laughed at your story and loved your sketch! Big dissapointment to me that I am missing your workshop in Stowe this weekend! I had just bought tickets to an event when I got the post about the workshop:(. Would love another chance to see you work! Can’t add much more to this other than ditto. Your sketches/paintings are always amazing. I wouldn’t go near a store on Black Friday thoI have a sister who gets up as early as it all starts and loves the crowds. Can’t believe we are related. thank you for your inspiration! rather than go spend my day in a store….i stayed home and drew and read…. Sketching, for me, is definitely a time where I can go to my “Happy Little Place” and BF would have sent me there faster than anything else. Great sketch sir! Beautiful work. Is that a single sheet folded into thirds? Looks like an efficient way to work compactly in the field. The colors are fabulous in these paintings. What color is the sky? M.Graham Turquoise and Indigo and some contrast tweaks when scanning. Great sketch, and equally excellent set-up story.